I'm back with another Doctor Who audio, surprise! 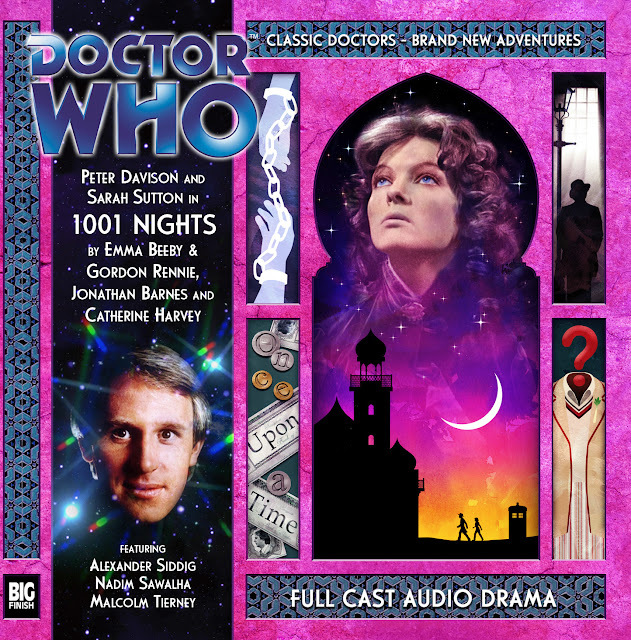 The Fifth Doctor and Nyssa star in the December release. It features four short stories with a frame that I think is awesome. Does it live up to the premise? The Fifth Doctor and Nyssa have arrived in ancient Arabia when they pick up a distress call from a Gantha ship. Soon, the Doctor is trapped in the Sultan's dungeons. As he tries to escape, Nyssa pleads with the Sultan for his release. The Sultan is amused by her stories and decides she should mimic Scheherazade. He decides that she and the Doctor will survive as long as he is entertained. The Doctor and Nyssa arrive on a prison asteroid at the edge of the universe. They find a prisoner being continuously tortured in an electric chair. The Doctor decides that he must be freed, but doesn't take his crimes into account. In 1892 Norwood, England at the home of Elizabeth Spinnaker. She and her butler, Mr. Hill, care for an insane woman and await the arrival of a Doctor. He soon arrives and must deal with the interplanetary menace locked in the woman. The Doctor and Nyssa arrive on a "dark and stormy night" to a tavern on some seaside cliffs. When they enter, they discover the natives have a curious method of currency. They tell stories to pay for things. Unfortunately, unscrupulous plagiarists abound. The last story concludes the frame narrative. The frame story starts off very typical and gets bizarre very quickly as both Nyssa and the Doctor deal with two different sultans. The telling of stories actually factors nicely into the plot and it even has a Middle Eastern flavored villain. There are definitely some cool ideas, but the ultimate conclusion is a bit unsatisfying. I wish the frame story had gotten more development. Overall, this a good listen, but nothing spectacular. Get it here from Big Finish!